First, You need to keep a good pelvis balance/mobility, it will protect your lower back and your belly. Here are few exercises you can easily do. Feel free to have a look at our YouTube channel to see full playlist of exercises. As your baby is growing up in your belly, your pelvis is opening, making it stiff and painful. Keeping your hips moving prevent pelvic pain and will help you to have a smooth delivery. Grab a Yoga mat and let’s work together! Lye on your back with legs straight. Now, open one leg with feet turning out and then bring it back with feet turning in. Pregnant or not, lower back pain is very common. But with a big belly, it becomes horrible! Every evening, before to go to bed, relax your lower back with this simple exercise. Lie on your back on the floor with a small pillow under your head; use our hand or a belt to bring your knee to chest. Breathe deeply as you do it. Breathing is essential as your chest is blocked because of your belly. You should feel the pressure of the floor against your tailbone. Do you remember last time you went for a run? How painful were your hamstrings the following day? Pregnancy is like running every day for your hamstrings. That’s why you need to stretch them every day. Lie on your back and lift one leg with knee straight, use a yoga belt if you need. Keep the other knee on the ground. Hold for 30s (it is the time you need to stretch properly your muscle). You can repeat it at least twice. We call it “the cat” (yes we stole some techniques mimicking our feline friends). Thanks to this stretching, you gently stretch your lumbar spine and your upper back. On all fours, Breathe out and gently pull tummy in and up while you tilt pelvis backward. Breathe in and relax your back. Repeat this movement 10-15 breathing. I don’t know if you already have a Swiss ball but it is going to be your best pregnancy friend ! So go online, buy one and ask to your wonderful partner to inflate it!. Today, I give you 4 exercises to do with it but we will see later how to use it for delivery and for post-natal rehabilitation. Obviously, you also can sit on it to watch TV, work on your laptop or just to relax. You will see with your bump, it will be more comfortable than your sofa. Stay on your knees but put Swiss ball in front of you and push it with both hands to stretch your back. 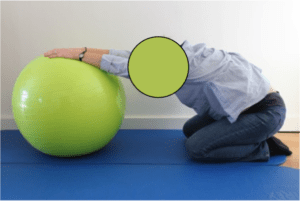 Sit on the ball and start by slowly tilting your pelvis forward and backward. Repeat this movement at least 10 times. Sit on the ball and tilt your pelvis on the side. Finish by doing figure of eight with your pelvis on both directions. Now, you have all the keys to move your pelvis by different ways. And if you are lucky enough to have a nice partner ready to help don’t hesitate to have a look at our playlist about How Dad Can Help in Pregnacy!